Mr. K looking after me. (as told by Heather Beather) It's 6:30 a.m. and I can tell Scottie Mom is having trouble getting out of bed. I sit patiently outside the bedroom doggie gate and wag my tail. Slowly, she gets up and comes to say hello. I start my best helicopter tail because I know what's next: a walkie! Mr. K and I get all leashed up and get going. Ahh! The fresh morning. I trot a little because there's a slight breeze and the quicker I pee, the quicker I get my breakfast! I tell Mr. K to hurry but he takes his sweet time. When we're upstairs again, I'm still so excited. I just know Scottie Mom's got a big bowl of yummy ready for me. Wait - where's she going? She invites me and Mr. K in the human room. FUN! I roll around on the rug and crash into Scottie Mom with my bottom up in the air and my tail flailing wildly. I even scratch my back on the bed post. Best. Morning. Ever! Only one thing missing: where's my breakfast? It never came. Instead, Scottie Mom drove me and Mr. K to the evil V-E-T again. 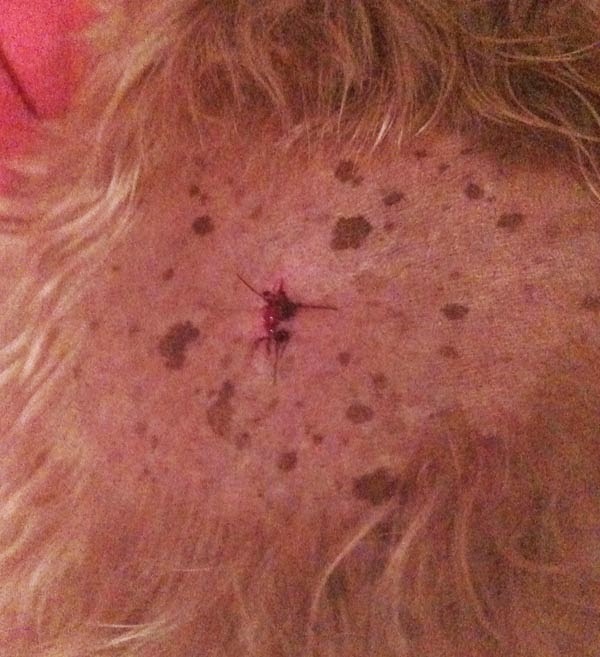 The vet lady points at three circles, one on my back, one on my neck and one on my eye lid. Then, she looks at a new one Scottie Mom found. It's hard but it doesn't hurt when she touches it, even though it is very close to my leg. Suddenly, I feel a poke. OUCH! Why does she always have to do that? OUCH! She does it again. Ok, this is no longer fun. I hear her tell Scottie Mom she doesn't usually get blood back in the syringe when she pokes a mass and that she wants to take the particles she stole from my body and put them under the microscope. She can do whatever she wants with them so long as she doesn't poke me again! Soon though, Scottie Mom sends me back with the lady and I go take a nap. 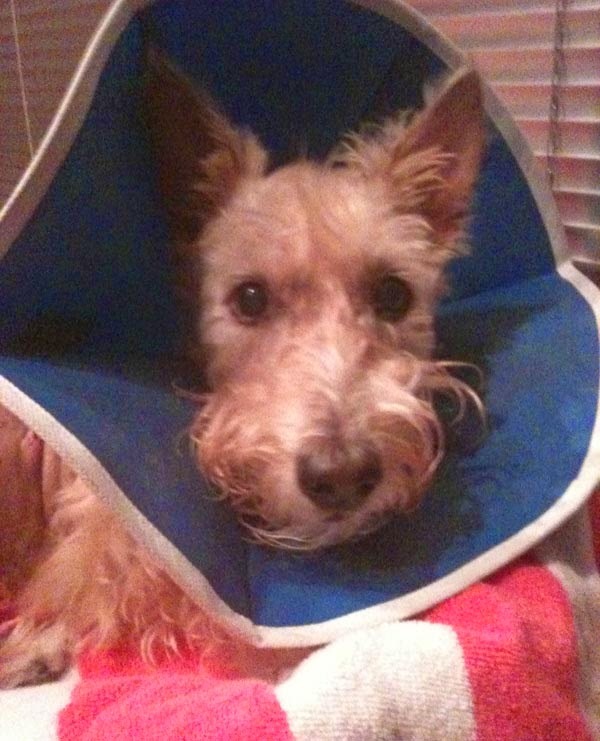 When I wake up, I can't find my Scottie Mom and I'm in a silver cage with one of those silly cones on my head. Drat. This is not a fun morning at all. 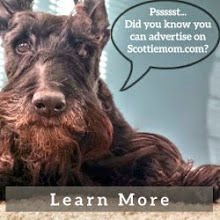 Where's my Scottie Mom? A couple hours later, I hear the evil V-E-T talking to someone, saying I'm doing well and sitting up in my cage since surgery. That's true but I do miss my Scottie Mom. She says she cleaned my teeth and had time to remove one tooth. What?! She stole my tooth, too? What is this place!? And Scottie Mom expects me to come back? Then, she said she took off all three spots. Oh yes, Scottie Mom told me about those. 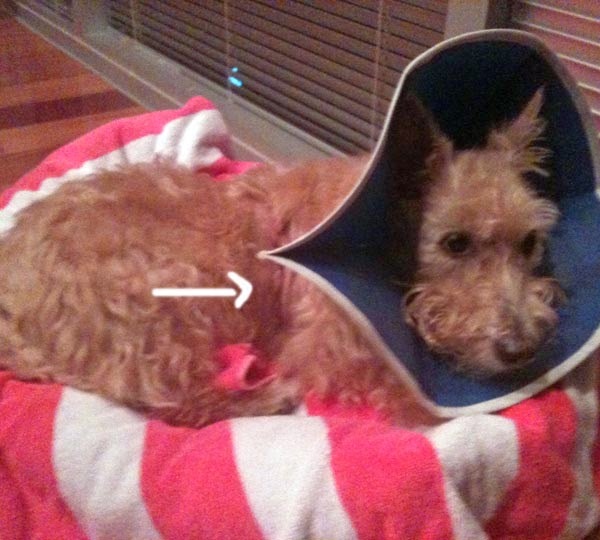 I had three little benign tumors that we agreed would be best to get rid of. I'm actually quite happy the vet lady took those from me. But what is this pain in my side and why do I have so many staples holding me together? The vet lady explains she had to open me up more and cut very deep, even into my muscle and she still can't be certain that she got "it all." What did she take from me now? Something tells me it was the new bump they found. Whatever it is, she tells the person she has to send it off to see if it is good or bad. I vote good, because I'm made of nothing but goodness! (If only this vet lady would stop stealing everything from my insides.) She then says she'll see the person soon and that I will be very happy. It MUST be Scottie Mom! Sure enough, Scottie Mom came to get me. She was very patient (I move kind of slow now) and helped me work my way around doors and such when my silly cone got stuck. I kept looking for a scrap of yummy on the ground on our way out. Boy, was I hungry! How could Scottie Mom forget my breakfast? We gotta get home fast. I wanted to jump in the car but Scottie Mom said no and picked me up instead. That was nice. I settled in, hanging my cone off the edge of the front seat. I hope we get some food soon. When we got there, I was so excited to be home that I didn't wait for Scottie Mom to carry me down. Utt oh, she wasn't happy with that decision. Doesn't she understand? I'm HUNGRY! It took me forever to walk our way to the apartment from where we parked the Scottie mobile but once we walked through that front door, it was all worth it. We were greeted by an ecstatic Mr. K who's jumping up and down and ushering us into the kitchen. I don't need to be asked to eat twice! Scottie Mom prepared a big bowl of the yummiest moist food I've ever tasted and Mr. K and I dug in and didn't come back up for air until our plates were clean! I vote "good" too! Glad you're feeling better! I vote good too! 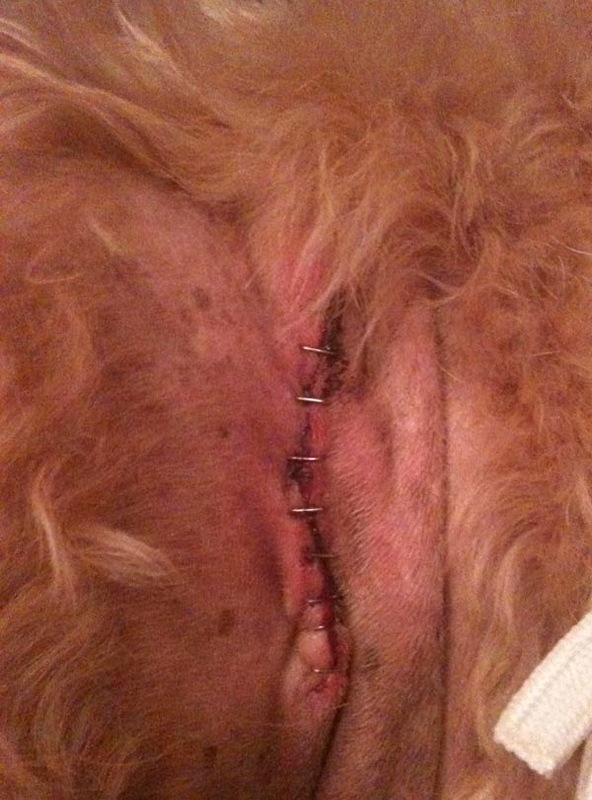 That is a huge incision !! Fingers still crossed!!! You weren't alone. 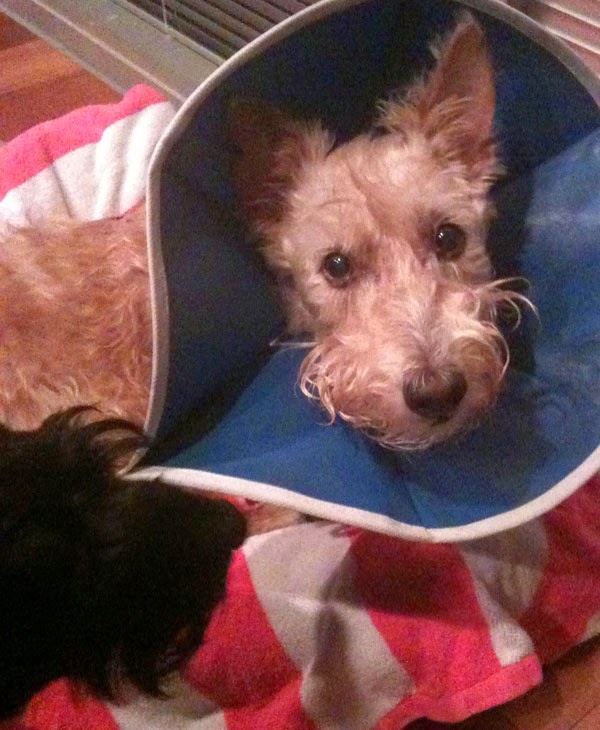 The v-e-t took something of Scottie Mom's also. The greatest moment in medicine is presenting the bill. My little Heather, thank you for sharing this experience with other Scottie Moms and Dads. We are learning from you and from your brave Scottie Mom. This is real Scottie love!! Our prayers are with you, sweetie!!! Yah! So glad to hear you're doing good! Now just relax eat yummy food and try not to think about the big, big, cone. I'm voting that all is going to wagging! holy moly! heather, you were such a brave girl! i have my paw crossed that everything turns out good! We send XOXO's to you sweet Heather! Feel better soon! Scottie mom should give you treats and yummy hooman foods, too. I used to give Duffy a little frozen vanilla yoghurt for a treat after the vet visits! As for Vet Lady~ We don't know her and we don't like her! Our Vet Dr Wen~ He's from China and is a Holistic Vet as well as Western Medicine...He looks in our eyes...hugs and kisses us....and always makes us feel comfortable...we LOVE him. Not to worry Heather..We know all will be ok...Just hang in there,wait for the results. You will be fine...after all our Big Scottie prayers for you. You want I should bite her for you ...that Mean Vet? You are a brave little angel, Heather. And you went through all of that and remained a perfect Scottie lady! I wish you a speedy recovery! The scots and I are all praying Heather had a much better day, today and that she continues to recover. 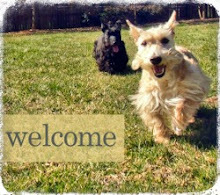 Nothing heals a little scottie better than a Scottie Mom and maybe several brothers and sisters.